The 5th Judicial District Problem-Solving Court serving York, Hamilton, and Merrick Counties held graduation ceremonies on January 4, 2019, in York County and January 7, 2019, in Merrick County. For Problem-Solving Court graduates, these ceremonies mark the completion of an intensive program of comprehensive drug treatment, close supervision, and full accountability. Presiding Problem-Solving Court Judges, James Stecker, of York District Court, and Judge Rachel Daugherty, of Merrick District Court, delivered the keynote addresses in their respective jurisdiction. Problem-Solving Courts run a minimum 18-month program where participants develop the skills to live a successful life free from drugs and alcohol. 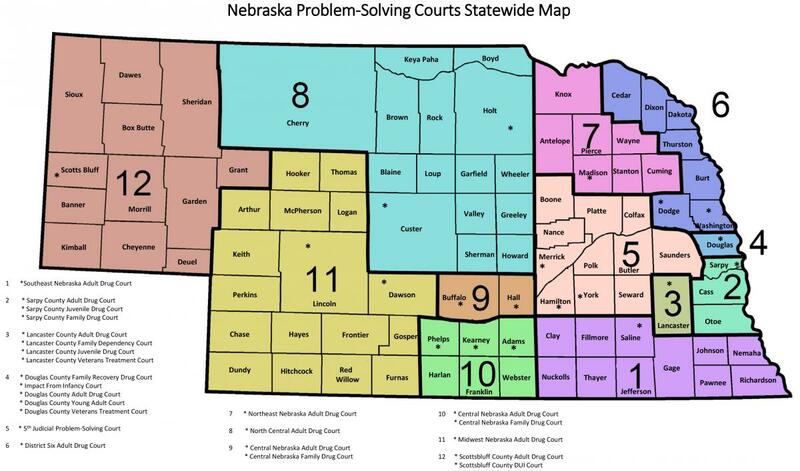 The 5th Judicial District Problem-Solving Court, like other Nebraska Problem-Solving Courts, operates under a team approach where a Judge, prosecutor, defense counsel, community supervision officer, law enforcement, and treatment provider work together to design an individualized program to best serve offender risk/needs. Engagement with appropriate treatment resources and court orders are verified by frequent alcohol and drug testing, close community supervision, and interaction with a Judge during non-adversarial court review hearings. Problem-Solving Courts enhance close supervision of participants by engaging with participants in their day to day environments including their home, employment, treatment, and community activities.